I got my latest Artoo last Saturday, at the Christmas Toy Con which reminded me that I needed an update of the last photo I took of all my astromech droids. I never really go for just figurines because I find them a little redundant to collect, so I like looking for the ones that have a double purpose haha! My only real figurine. It was free from one of the gas stations (I don’t remember which) here when the digitally remastered original trilogy was shown in cinemas. Opens up, has a Princess Leia holding a blaster inside. Bag ornament thing. From McDonald’s. The Pez Dispenser’s the newest one. I’m already out of Pez. Do candy stores still sell just refills? I haven’t seen those in a really long time. I was actually supposed to write about all the issue #4’s of my pull list, but Batman #4’s just arriving tomorrow so that’s gonna have to wait. 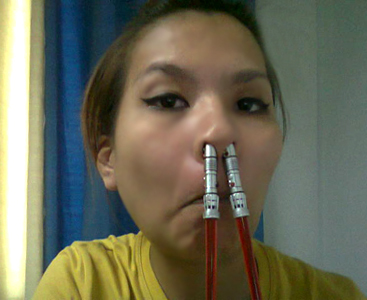 Guess who just won herself a pair of Kotobukiya Star Wars chopsticks? I am the Walrus. I also must be the world expert in taking unflattering photos of myself. I had been lusting after these for a while now so when Rotch announced she was giving away 2 pairs on her blog, I pretty much spammed her comments box with entries. My 5th raffle entry won me the Darth Maul set! Yay! Which is awesome cause I never win at raffles. Ever. This is probably my first. 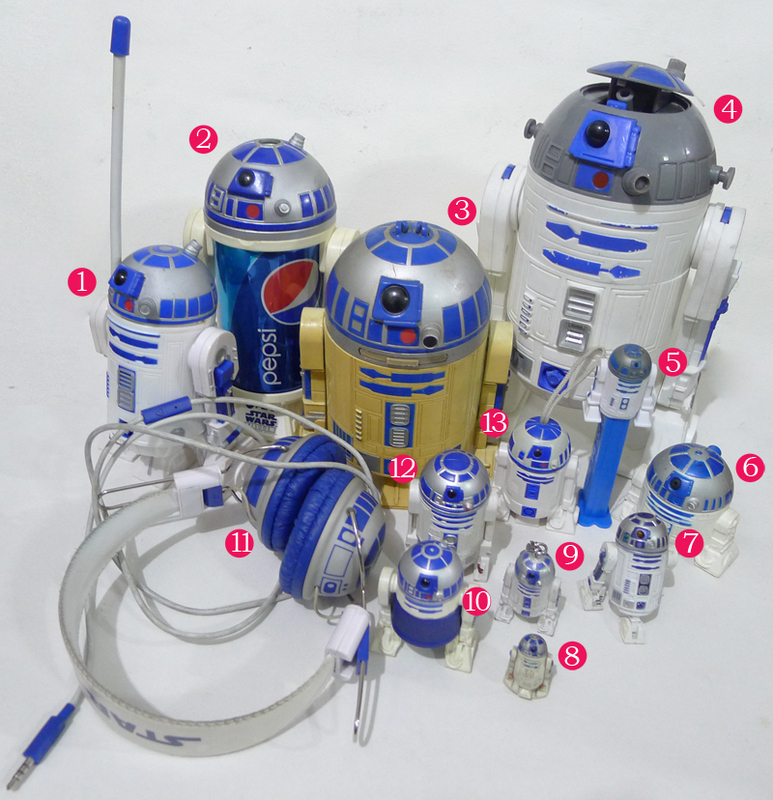 The other pair that was going to be given away was the Mace Windu set, which would have been awesome too because then it would match my Mace Windu lightsaber toy. Click to embiggen crappy camera phone photos. 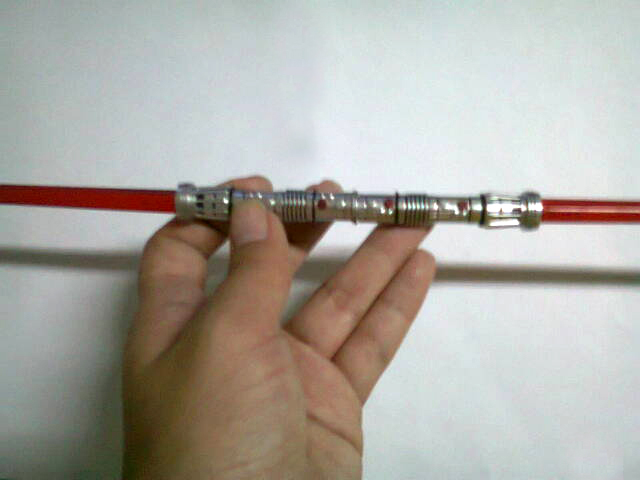 What makes the Maul set the most badass of all the other sets is they have magnets at the ends and you can stick them together to get Maul’s signature double-bladed lightsaber yeahhh. 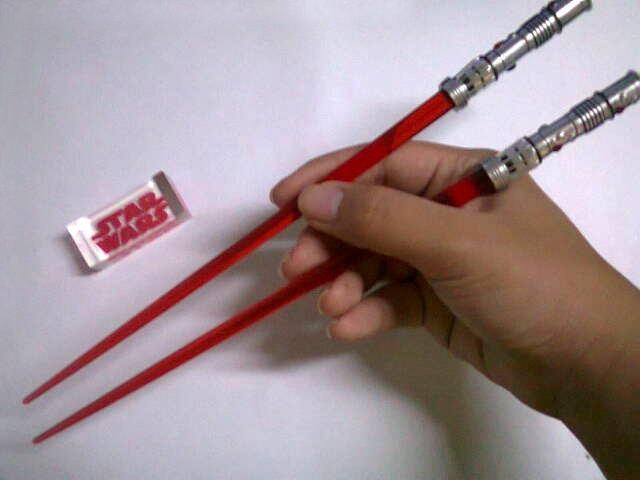 It also comes with a matching Star Wars chopstick rest. Yeahhhh. 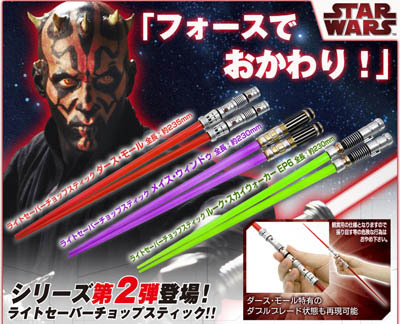 Posted byGab 23.Sep.2010 12.Jul.2011 Posted inFangirlingTags: chopsticks, Darth Maul, Kotobukiya, lightsaber, star wars2 Comments on Lightsaber Rider!